We've always been slightly obsessed with vintage jewellery and accessories but as this A/W season covets the ladylike, we've gone vintage crazy! Our Vintage Inspired collection consists of beautiful jewellery either originating or based-on designs from yesteryear. 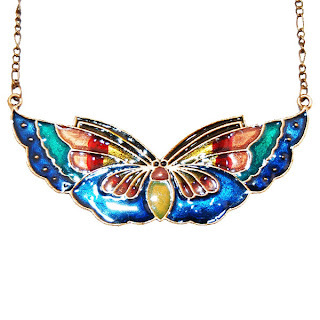 It was love at first sight with this absolutely stunning Multi-Colour Enamel Butterfly Necklace. Its heavy antique gold setting adds to the vintage charm and the vibrancy of the colours really catches the eye. A resplendent statement piece. Priced at £12 it proves the perfect vintage pick-me-up! 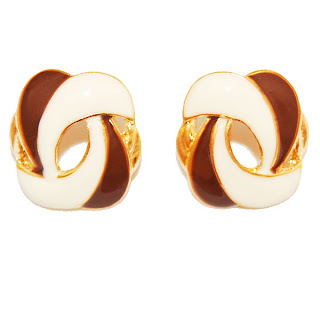 These Vintage Spiral Earrings are loaded with 1950s/1960s appeal. A gorgeous addition to your earring collection, they're elegant yet scream out to be noticed. The coffee and cream colouring adds a rich vintage twist. These are priced at £6. If love was in necklace-form, then this would be it. 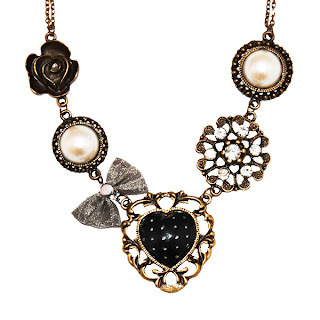 This wonderful Victoriana Necklace is the perfect accessory for ladylike days. With an antique gold setting decorated with pearls, bows, crystals, flowers and hearts, the detailing is wonderfully vintage! A vintage dream and priced at £10, it's also within budget! 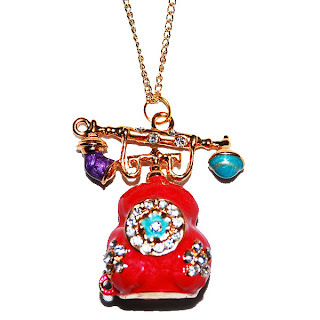 The Antique Telephone Necklace is an all-time fave at Chelsea Doll, we just can't take our eyes off it! Screaming attention-seeker, its retro credentials are impeccable. The telephone itself is coloured bright purple, red and blue and the dial and handpiece are adorned with crystals. This necklace really takes the wearer back to the early 20th century. Priced at £18, it's the best way to make a statement! Visit the Chelsea Doll Vintage Inspired collection to find your charming remake from bygone days and revive sought-after looks of previous decades. The only way to add a vintage twist to an otherwise modern-day look! The victoriana Necklace is gorgeous !! I just found your website and it directed me to this blog !! your jewelry is amazing !! I also have a youtube account, and i had to make a video about your jewelry !! And if you want i can advertise your items on my blog and my youtube !! Thanks very much for your feedback on our collection. We really appreciate it! The Victoriana Necklace is one of our all time faves too. We've just added your blog to our Fave Blogs list on here too!